By the time European explorers entered the Pacific in the 15th century almost all of the habitable islands had been settled for hundreds of years and oral traditions told of explorations, migrations and travels across this immense watery world. Double-hulled canoes were seaworthy enough to make voyages of over 2,000-miles along the longest sea roads of Polynesia, like the one between Hawai‘i and Tahiti. The motivations of the voyagers varied. Some left to explore the world or to seek adventure. Others departed to find new land or new resources because of growing populations or prolonged droughts and other ecological disasters in their homelands. Within the sphere of known islands, others sailed to wage war or seek vengeance, to escape political persecution or unhappy love affairs, to find a wife or visit relatives, or to obtain prized objects, like red feathers, not available at home. Whatever the motivation for voyaging, the challenge was always the same – the huge, trackless expanses of sun-heated saltwater capable of generating fierce winds and battering waves. Moʻikeha was an aliʻi nui (high chief) from Moa‘ulanuiakea, Tahiti, where he lived with his wife Kapo. They had a child named Laʻamaikahiki. Moʻikeha became infatuated with Luʻukia, but she created some domestic difficulties; Moʻikeha directed his foster-son Kamahualele to ready a double-hulled canoe to go to Hawaiʻi. Moʻikeha planned to take his sisters, Makapuʻu and Makaʻaoa, his two younger brothers, Kumukahi and Haʻehaʻe, his priest Moʻokini, and his prominent men (na kanaka koikoi) – navigators (ho‘okele), favorite priests (kahuna punahele) and his lookouts (kiu nana,) who would spy out land. Early one morning at dawn, at the rise of the navigation star (ka hoku ho‘okelewa‘a; possibly Sirius), Moʻikeha boarded his double-hulled canoe with his fellow voyagers (hoa holo), and left Tahiti. After the canoe landed at Hilo, Kumukahi and Haʻehaʻe were charmed by the land and told Moʻikeha they wanted to remain there, so Moʻikeha let them off the canoe. Soon after, Moʻikeha set sail from Hilo, passing along the north coast of Hawai‘i until he arrived at Kohala. Moʻokini and Kaluawilinau wanted to reside at Kohala, so Mōʻīkeha put them ashore there. He sailed on to the east coast of Maui and landed at Hāna. 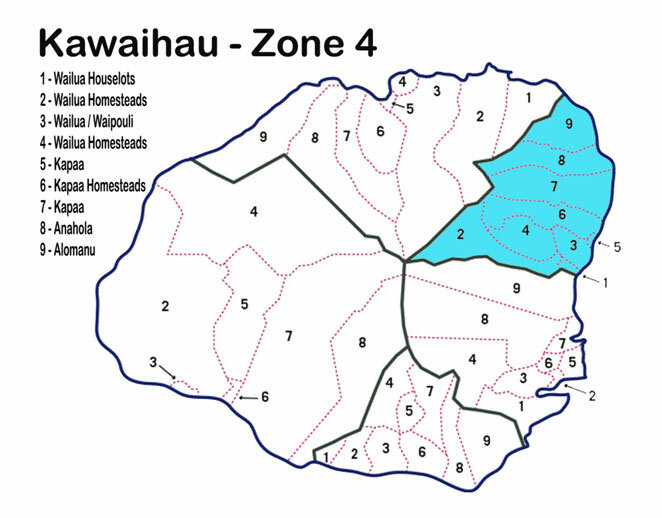 Honua‘ula wanted to reside there, so he was allowed to remain behind. Moʻikeha sailed on. Moʻikeha and his people continued on their journey. Arriving at O‘ahu, Mo‘ikeha’s sisters Makapu‘u and Makaaoa said: “We wish to reside here, where we can see the cloud drifts of Tahiti.” So Makapu‘u and Makaaoa were allowed to remain on O‘ahu. Moʻikeha left O‘ahu and sailed to Kauai, landing at Wailua. The canoe was brought ashore and the travellers got off. Meanwhile the locals were gathering in a crowd to go surf-riding at Ka-makaiwa. Among them were the two daughters of the ali‘i nui of Kauai, Ho‘oipoikamalanai and Hinauʻu. When the two sisters saw Moʻikeha, they immediately fell in love with him, and they decided to take him for their husband; Moʻikeha was also struck. Their father approved. Kila, Moʻikeha’s favorite of three sons by the Kaua‘i chiefess Ho‘oipoikamalani, was born at Kapaʻa and was said to be the most handsome man on the island. It was Kila who was sent by his father back to Kahiki to slay his old enemies and retrieve a foster son, the high chief La‘amaikahiki. Moʻikeha settled at Kapaʻa Kauai as ruling chief of the island. Upon his death, Kila, his son, became ruling chief of Kauai. (McGregor) After Moʻikeha’s death, his corpse was taken to the cliffs of Haʻena where it was deposited. Laʻamaikahiki lived on Kauai for a while. Then he moved to Kahikinui on Maui (the place was named for Laʻamaikahiki’s homeland, in honor of him.) As the place was too windy, however, Laʻamaikahiki left for the west coast of the island of Kahoʻolawe, where he lived until he finally returned to Tahiti. The first Japanese immigrants to the Islands, like the Chinese, appeared not long after Western contact, but the greatest numbers arrived in the mid-1800s to fill the labor needs of the sugar plantations. The growth of the sugar industry as the base for the Hawaiian economy in the 1850s gave impetus to an increased demand for imported labor. Japan was not open to Western recruitment until 1868; that year, the first group of 148 Japanese immigrants included 140 men, six women and two children. King Kalākaua visited Japan for ten days in 1881 while making a global tour. His meeting with Emperor Meiji improved the relationship of the Kingdom with the Japanese government, and an economic depression in Japan served as an impetus for agricultural workers to leave their homeland. The US Chinese Exclusion Act of 1882 stopped the flow of Chinese workers to the Islands; sugar planters turned to Japan. Farmers and peasants from southern Japan (mostly from the areas of Hiroshima, Yamaguchi and Kumamoto,) having suffered a series of crop failures at home, filled the Hawaiʻi jobs promising comparatively high wages. The trickle of workers arriving in 1868 turned to a flood by 1886. The Russo-Japanese War (1904 –1905) was “the first great war of the 20th century.” It grew out of rival imperial ambitions of the Russian Empire and the Empire of Japan over Manchuria and Korea. With Vladivostok only operational during the summer season, Russians sought a warm water port on the Pacific Ocean for their navy, as well as for maritime trade. Japanese residents on Kauaʻi raised funds to support Japan’s war effort. After the Japanese victory, in appreciation of the community’s support, Japan sent money to be used to build monuments honoring the Japanese soldiers who had lost their lives in the war. In 1915, two such monuments were erected, one in Kapaʻa, the other in Līhuʻe. They were also intended to honor Emperor Taishō’s ascension to the throne that year. 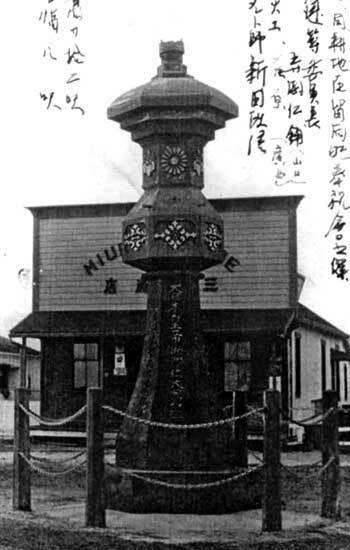 The Kapaʻa monument was a 15-foot Ishidōrō (stone lantern) placed across the dirt highway from Miura Store. Over the centuries the Ishidōrō evolved and were adapted for the practical purpose of lighting the grounds of religious sites, and have since become popular by placing them (in varying sizes) in the gardens of tea houses and private residences. For many, the monument represented the Japanese immigrants’ respect for their culture and homeland, and for others, their intention to return to their families and communities in Japan, after saving up money from plantation work on Kauaʻi. However, as World War II heated up, anti-Japanese sentiments grew, and community pressure built to remove the monument. In April 1943, county work crews toppled and buried the massive structure. Over the decades, the Ishidōrō was long forgotten. Then, in 1972, some children playing at Kapaʻa Beach Park noticed a metal rod sticking out of the ground and feared people could get injured. The County crews working to remove it soon realized that it was part of the old Ishidōrō monument; Kauaʻi Historical Society stepped in and urged it be removed. It was later re-erected through a community effort led by Mayor Tony Kunimura, the Kaua’i Historical Society and others. For the next 20 years, the damaged and aged lantern stood supported by steel braces. In 2008, with funding from the Kauaʻi County/HUD Community Development Block Grant Program, the Ishidōrō was fully restored, through the efforts of the Kapaʻa Business Association and others. Congratulations to the community and coordinators Larry Dill, Pat Pannell and Rayne Regush of the Kapa‘a Business Association, and Leadership Kaua‘i on earning a ‘2009 Leadership in History Award’ from the ‘American Association for State and Local History’ for the Japanese Stone Lantern Restoration, Kapaʻa, Kaua‘i. The image shows the original Ishidōrō across the road from Miura Store, Kapaʻa, Hawaiʻi. In addition, I have added other related images in a folder of like name in the Photos section on my Facebook and Google+ pages.